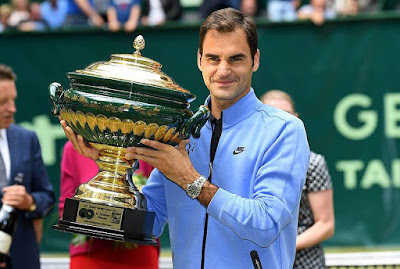 Roger Federer started perfectly and never looked back in the Gerry Weber Open final in Halle on Sunday, sprinting to a 6-1, 6-3 victory against rising star Alexander Zverev under the roof in Gerry Weber Stadion in just 53 minutes. The dominating title victory gives Federer his ninth Halle crown, joining him with Rafael Nadal as the only two men in the Open Era who have won a tournament more than eight times. Nadal has won 10 Monte Carlo Masters, Barcelona and Roland Garros titles. 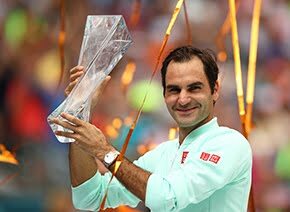 Federer improves to 4-0 in title matches this season, having won the Australian Open, the BNP Paribas Open in Indian Wells and the Miami Open. He and Nadal are now tied for the lead this season. “It's great to get off to a good start in the finals and then remind yourself that you've been playing good tennis all week. You start swinging freely, things start clicking, you realise your opponent is under pressure and you keep pressuring him,” Federer said. The 35-year-old Swiss also shoves aside any worries fans or pundits might have had about his long layoff affecting his grass-court season. 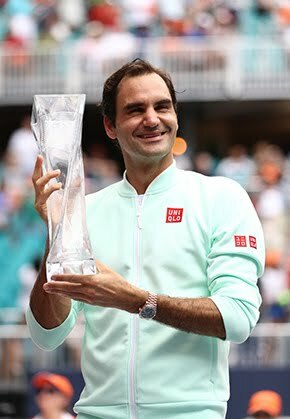 The veteran right-hander took off 10 weeks after winning the Miami title on 2 April, opting to skip the clay-court season to rest his body and hopefully stave off any future possible injuries on clay. 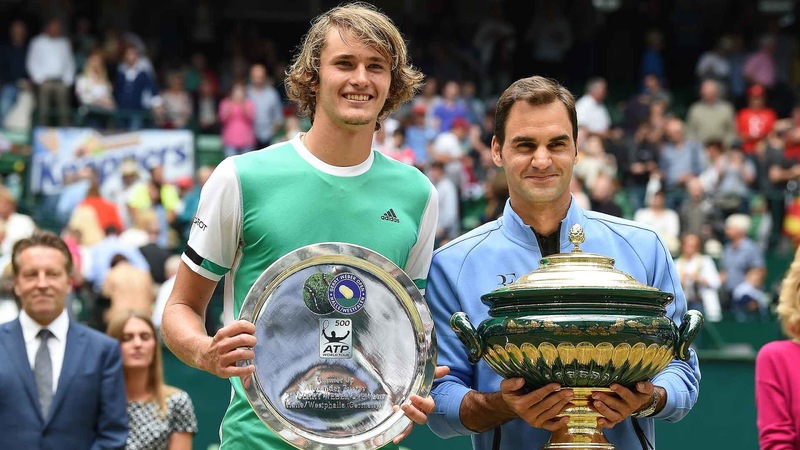 After losing in his return on 14 June to friend Tommy Haas in Stuttgart, Federer checked off five consecutive victories, including wins against Zverev and rising youngster Karen Khachanov, and heads to Wimbledon full of winning feelings. The Stuttgart defeat was the first time Federer had lost his opening match at a grass-court tournament since 2002 Wimbledon (l. to Ancic). “I was doubting myself a little bit, I must admit, because losing in the opening round for the first time in 15 years on grass was always going to shake me a little bit and it did. So I'm happy to react right away and let that be forgotten and actually move on and remind myself I actually can play well on grass,” Federer said. “It's a boost for me personally, with my confidence, knowing that my body is in good shape. Mentally, I'm fresh again and I've gotten used to match play. Zverev also had been 3-0 in title matches this season before Sunday, having won in Montpellier (d. Gasquet), Munich (d. Pella) and Rome, where he beat World No. 2 Novak Djokovic for his first ATP World Tour Masters 1000 title. The 20-year-old German also had beaten Federer only a year ago in the same stadium, outlasting Federer in a three-set semi-final to reach the 2016 Halle final. But the German had no answer for Federer's aggressive play and near perfect execution. Federer won the first seven points of the match, breaking Zverev to love in the opening game and holding to 15 to get the crowd behind him and to shock Zverev. Coming into the final, the German had lost his serve only twice all tournament, having won 46 of his 48 service games. But after 22 minutes, Federer had already broken Zverev three times en route to a one-set lead. The Swiss was swinging freely from both sides, placing Zverev on defense from the start of nearly every point. And when Federer had Zverev feet behind the baseline, he would sagely deliver a drop shot and send Zverev sprinting. Zverev, No. 12 in the ATP Rankings, regained some belief in the second set, seeing a break point in the first game. But Federer erased it with a service winner. The nine-time Halle champion won 93 per cent of his first-serve points (26/28). Federer clinched his 16th grass-court title with a backhand volley winner.